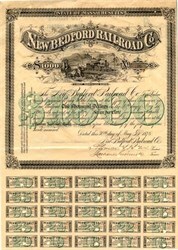 Beautiful certificate from the New Bedford Railroad Co issued in 1876. This historic document was printed by J.H. Bufford Sons Litho Company and has an ornate border around it with a vignette of a steam locomotive. This item has the signatures of the Company's President and Treasurer and is over 131 years old. Light residue on back. 40 coupons attached on bottom. The Taunton Branch Railroad was incorporated in 1835 as a branch of the Boston and Providence Railroad from Mansfield to Taunton. It was built from 1835 to 1836, and operated at first by the B&P. The New Bedford and Taunton Railroad was incorporated in 1838 at the Old Colony Railroad, changing its name in 1839 to the New Bedford and Taunton. Construction ran from 1839 into 1840, extending the line to New Bedford, at which time the Taunton Branch split from the B&P and ran concurrently with the NB&T. In Taunton was a short branch, known as the Weir Branch or Taunton River Branch, owned jointly by the two companies. In 1873 the two merged into one, forming the New Bedford Railroad.